Defying trends in other recreational markets across the United States, wholesale cannabis prices in Nevada continue to rise a year after adult-use sales began. Looking ahead, there are few signs prices will fall anytime soon. By contrast, wholesale cannabis prices in other states have been declining for years. 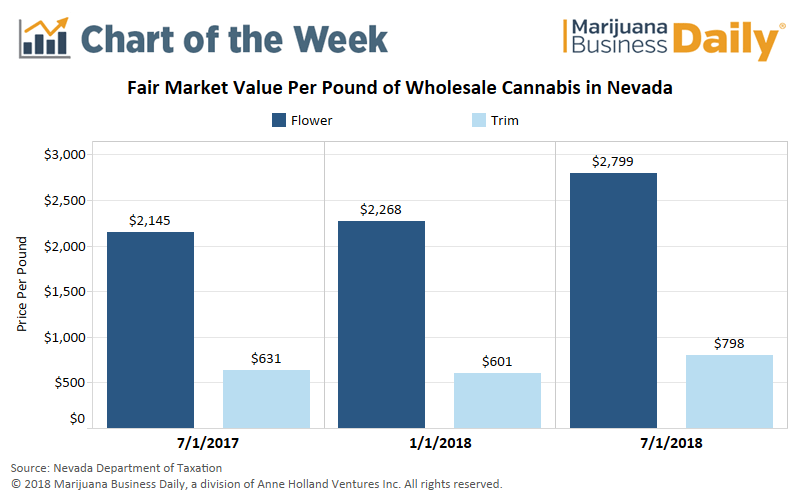 The fair market value per pound of wholesale flower – a metric used by the Nevada Department of Taxation to levy taxes on the state’s marijuana growers – has jumped more than $650 from July 2017 to July 2018, a 30% increase. The wholesale price per pound of trim has climbed 26% over the same period. Demand for recreational marijuana in Nevada has been stronger than many industry experts initially anticipated and has continued to grow. Adult-use sales in Nevada totaled nearly $189 million through the first five months of 2018, an average of $37.8 million per month. That’s up 16% from average monthly rec sales of $32.6 million in 2017. Rec sales began July 1, 2017. Overzealous cannabis testing standards that have curbed supplies at the retail level. Cultivation facilities that are unequipped to handle heat and humidity. “It’s not necessarily a dearth of supply, it’s rigorous testing standards keeping prices high,” he said. Taracki also noted: “A lot of cultivators have issues with humidity in their grows, cutting corners on the humidifying and air conditioning, especially this time of the year when the temperature is 120 degrees. Marijuana that doesn’t pass testing can be sold at a lower price to processors, whose extraction procedures remove microbials and impurities. But with high testing failure rates, cultivators are forced to charge retailers extra for marijuana that meets the stringent criteria. Looking forward, Taracki foresees prices staying where they are for at least another year if testing standards remain unchanged. If this is correct, why have prices at the Dispensaries been dropping? Could be competition, I’ve seen some good prices on 1/4’s lately and some oil. Maybe retailers are settling for less profit now as they raked it in when it started? Dispensaries have to compete with street prices hovering around $100 an oz. It’s like a check and balance that keeps dispos from getting monopolistically greedy. The numbers are all BS. They are artificially inflated by vertically integrated facilities. Cultivation facilities reported sales of flower for $10,000 per pound and $4000 per pound for trim for the last six month fair market value period. You can find the fair market value calculations table on the State of Nevada Tax website.